It's been a while since I've read just for the enjoyment of reading. 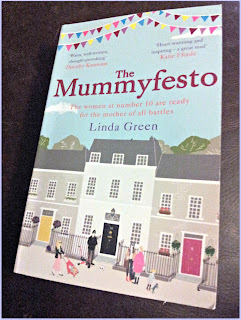 'The Mummyfesto' by Linda Green was the perfect book to take me back to the pleasure of just reading. And becoming absorbed in the characters, and their lives. And having tears, of laughter and of sadness. The first time I cried whilst reading the book I put it down to tiredness and went to bed. The next morning I carried on reading and ended up scaring the children with puffy eyes, from crying so much before they had woken up. The book is based on the two things which probably bother anyone who has been on maternity leave- what happened to my life? How can I get something back which takes on board my new priorities? When Sam, Jackie and Anna successfully campaign to save their lollipop lady, a TV reporter asks them if they fancy standing in the general election. It is, of course, a crazy idea: Sam’s youngest child has an incurable disease; Jackie is desperate for another child and her mum is struggling with Alzheimer’s; and Anna’s teenage children, and marriage, are in danger of going off the rails. It is of course made amazingly real, the issues become entwined in the character's lives but are real issues. And I loved the book. This really is the kind of book to read to get back into reading, or to have something to read which allows you to escape to a reality it wouldn't be so bad to be a part of. And, as the added hook for me, the setting is Hebden Bridge, West Yorkshire. Having spent five years in Todmorden, with Hebden as the place for great shopping and great evenings out, it was a difficult read from not getting overly nostalgic. It was great to know the setting so well, and did give the book a slight bittersweet edge, the perfect setting, which Mr J and I miss greatly. A real testament that a book can make memories so real. Disclaimer: I received a copy of the book for the purposes of the review. The views contained are my own. Defo need to have a read of this I think! Are you 'Ready for Anything'? !